Do you ever just lose all willpower and start craving the most decadent calorie filled chocolaty sweet treat? Every few months I get those type of cravings. I usually don’t have too much of a sweet tooth, but when I do get a craving I have to go all out. So a few days ago, I gave into my chocolate cravings and made the most decadent and easy chocolate cake I know how to make. Now this isn’t so much of a recipe, as a tip on how to make a package of boxed cake mix into the moistest, richest cake you’ve ever tasted. To doctor up a regular cake, I add an extra egg, substitute milk for the water, and substitute butter for the oil. But for this sinful creation, I also added 2/3 can of frosting. 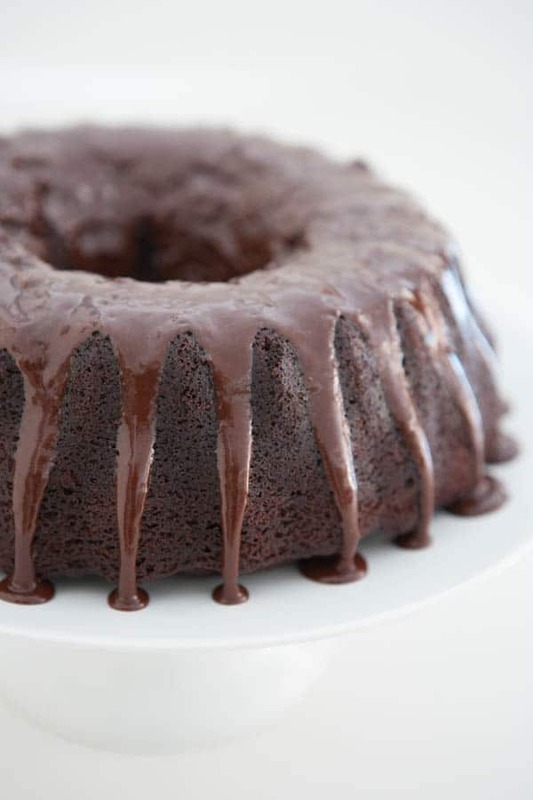 This makes the cake so sweet, chocolaty, and moist you won’t believe it. After the cake has baked, I take the rest of the frosting from the can and zap it in the microwave for a few seconds before drizzling it all over the top of the bundt cake. This recipe can also be altered to make whatever combination of cake and frosting mix you like. For instance you could do German chocolate cake and German chocolate frosting, carrot cake and cheesecake frosting and butter pecan cake with butter cream frosting. Heat oven to 350°. Combine cake mix, milk, butter, eggs and 2/3 of the container of frosting in a stand mixer or large bowl. Beat with electric mixer on medium for 4 – 5 minutes, or until smooth. 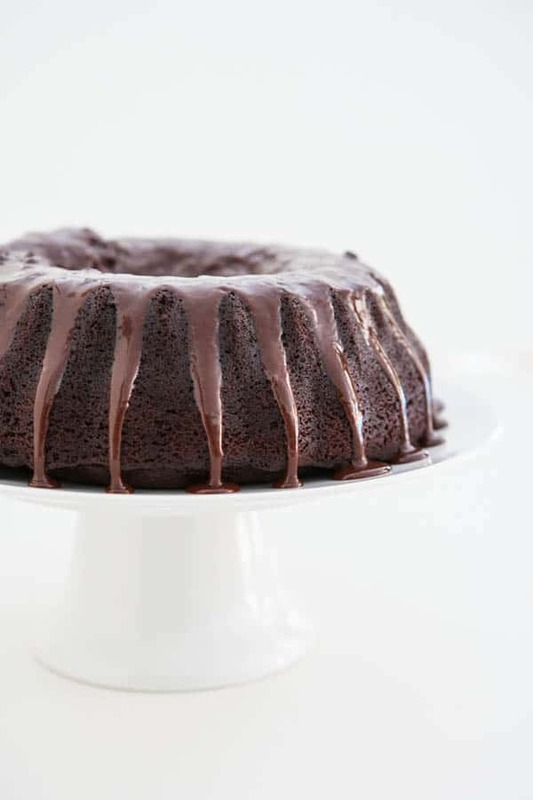 Pour batter into a greased Bundt pan and place in oven to bake for 40 – 50 minutes, or until toothpick comes out clean when inserted in the middle of the cake. Let cake cool completely before inverting on a cake plate. 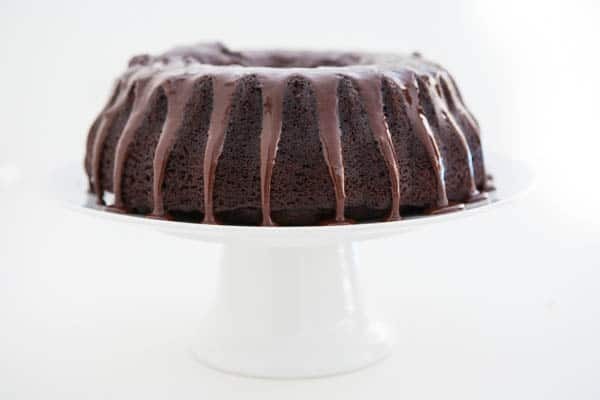 After you have inverted the cake on a plate, place the remaining frosting in a microwave safe bowl and cook k on high in the microwave for 20 seconds. Drizzle warm frosting over bunt cake. Tips: This recipe will work well with any cake and frosting flavor combination. Other flavors you might want to try are: German chocolate cake and German chocolate frosting, carrot cake and cheesecake frosting and butter pecan cake with butter cream frosting. This post sponsored by Hershey. All opinions 100% mine. Going to Pin this into my “cheat” food board!! Yum. Ooooooooooh this looks SO GOOD. I have a jar of that frosting in my cupboard right now… just need the cake mix and I’m all over this! I pretty much get those cravings on a daily basis … oops! This cake looks fabulous! Oh My GAWSH!! This looks sooo amazing! Oh, Angie, this looks so good. WOW! A big slice of this and a tall glass of milk would be hard to beat! Gorgeous photos!! A good (big) slice of chocolate cake is hard to resist! Yours looks fantastic!! This looks fabulous! Love the chocolate dripping over the edge. Makes me want to dive right in! That cake is art. Gorgeous! I want a big cold glass of milk and a big slice of this cake! I could eat this right now — for dinner, lol! How do I print this? Sounds really great and oh so moist, but I need to print it. How do you do the icing? Mine NEVER looks like this!